On December 20th at the ABA studio. A chance to present the results of my research and talk about the plans for the future – and for the rest just drink and talk. Thanks everyone, it’s great you were there! Postponed until January: Fourth salon on December 14th, on public art’s relation to ‘the rest of the art world’. Within contemporary art practice, discourse and cultural theory, there has been quite some attention for ‘publicness’: artworks seeking social relations, artists engaging themselves with the public cause and finding ways to infiltrate the media and other public spheres. This does not seem to have resulted however in serious attention from art institutions for engaging with public art. Is this a matter of time or are there chances being missed? Third Salon on November 28th. In Berlin, but in fact in many European cities, there is a great big legacy of public art ‘inspired’ by building situations: re-building after World War II, large scale city housing extensions in the sixties, building new public institutions etcetera. This tradition has become somewhat of a cliché, a separate idiom, and in a sense an invisible or ‘taken for granted’ part of the built environment. How do we – how could art – deal with this tradition? An idea for a public art project. Joining us: Vincent de Boer (curator at Stroom Den Haag, NL), Hans Dickel (publisher of Kunst in der Stadt, Skulpturen in Berlin), Dominique Hurth (artist), Constanze von Marlin (art historian, researcher), Dieter Roelstraete (curator at MuHKA), Yorgos Sapountzis (artist) and Axel Wieder (curator, mediator for New Patrons). Location: Dutch Embassy at Klosterstrasse. See also this post. Second Salon on November 2nd. Joining us a.o. 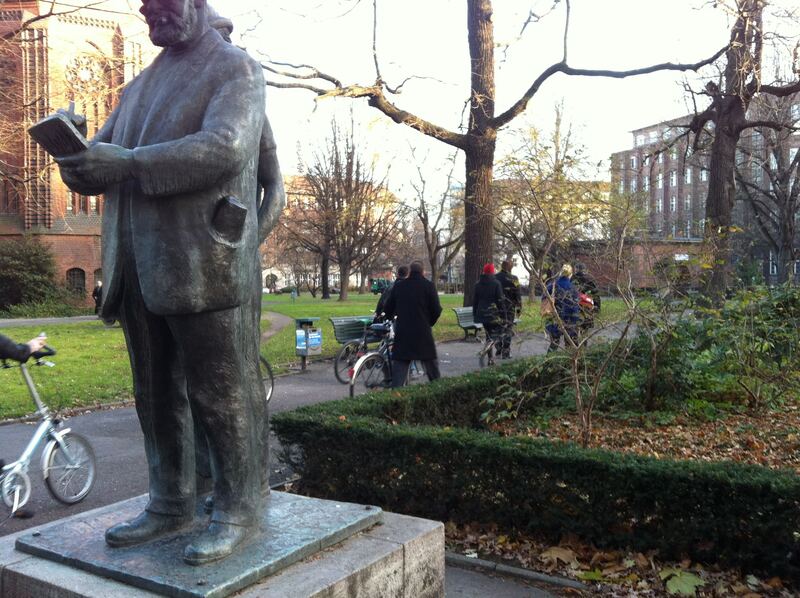 : Philip Horst (Skulpturenpark Berlin_Zentrum), Susanne Prinz (Verein zur Förderung von Kunst und Kultur am Rosa-Luxemburg-Platz e.V. 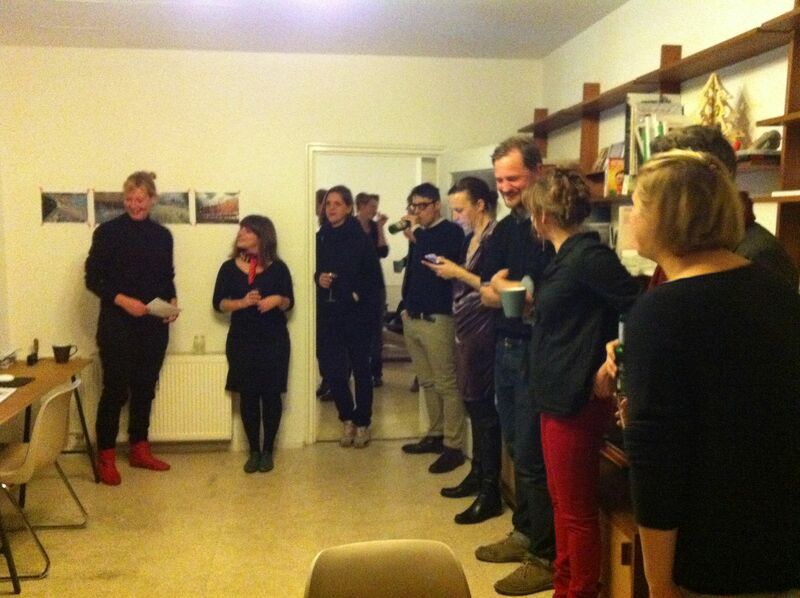 ), Mariska van den Berg (art historian, investigating forms of appropriation of public space), Lars Ramberg (artist). 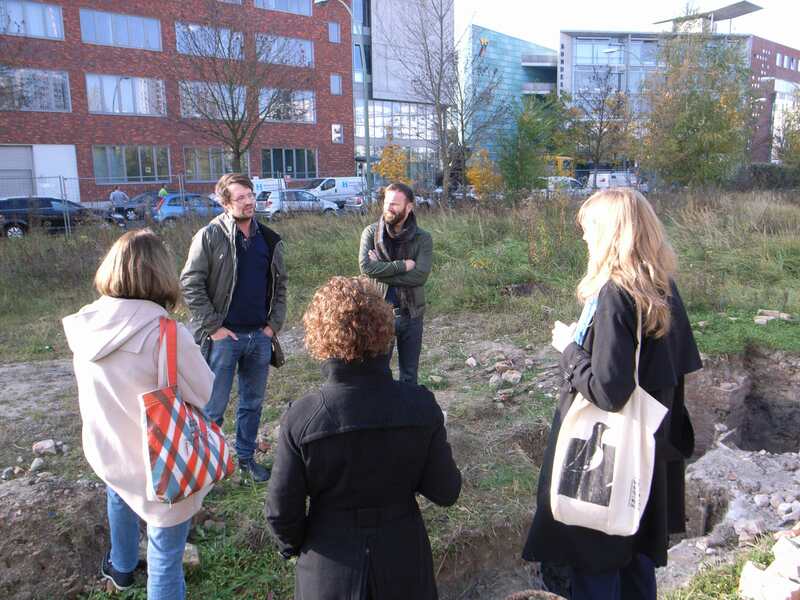 We visited the site of Skulpturenpark and in our discussion focused mainly on the ‘do it youself’ qualities of Berlin, when initiatieves for public art projects come from artists or private parties. See also this post. First Salon on September 12th, an introduction of the project and the residency to those who were curious about it. In the picture, left to right: Jeroen Jacobs, Nina Köller, Hester Oerlemans, Ilka Tödt, Susanne Kriemann. Not in the picture were Dominique Hurth, Aleksander Komarov, Billie and Kristian. Good kick off!